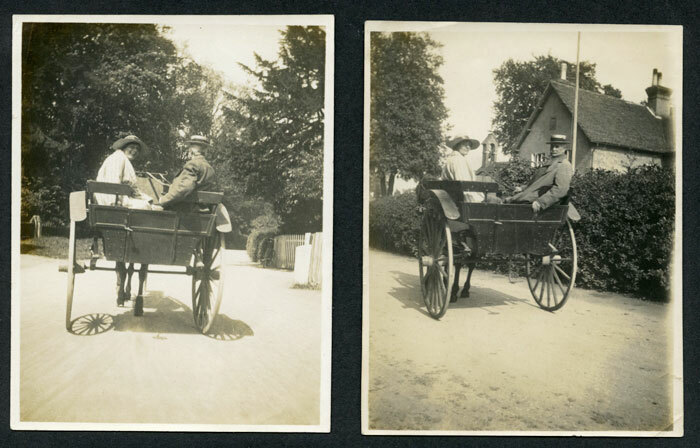 Photos shown here are believed to be from Cambridgeshire. Do you recognise the location or occasion? Any help in identifying these will help us to get them to an owner who will appreciate them and ensure their future safekeeping. Can you help us to rescue these strays? If you recognise any of these images, please contact webmaster@fadingimages.uk. 1. 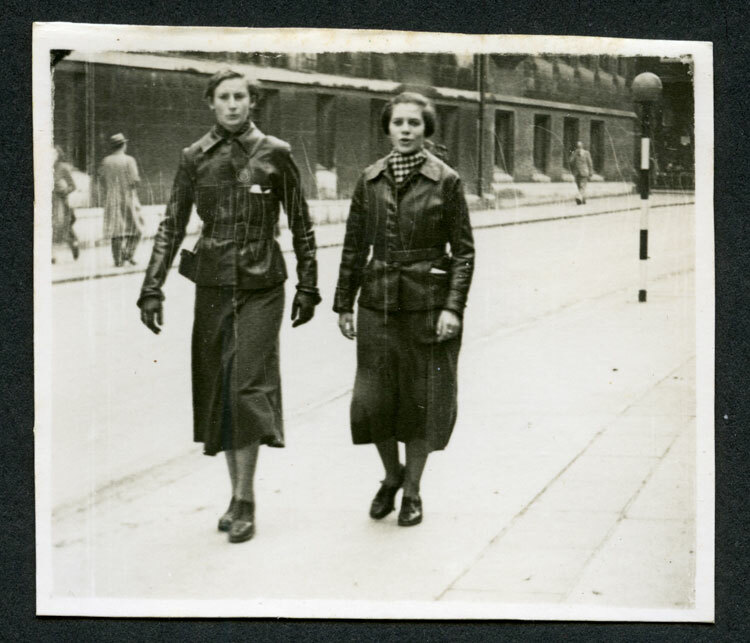 Cambridge - Ladies in uniform? 1936. The image below was a recent Ebay purchase. It depicts two young women walking in what appears to be St Andrew's Street Cambridge, (opposite Christ's College). The print is 2 ½ x 2 ⅛ inches. On the rear is printed "Photo by Topical Pictures" and handwritten "Cambridge 5 October 1936". The image raises a number of questions. The young women appear to be dressed in similarly with what looks like belted dark leather jackets, mid length dark skirts, black shoes and with relatively short-cut hairstyles. Was this some sort of uniform, or just a passing fashion of the day? The date could put this into the period of Mosley's Black Shirts (The Battle of Cable Street occured on 4 Oct 1936) but could this be the sort of uniform worn by Mosley's followers? And what about the photographer? The format, the framing of the subjects and soft focus all point to an amateur, rather than a professional photographer. But does the "Photo by Topical Pictures" on the reverse suggest a professional shot, perhaps by a street photographer of the type normally taking "walking pictures" of holidaymakers at seaside towns? We have not yet come across a local firm of this name. Alternatively, could this refer to a processing lab or photographic paper supplier, rather than a particular photographer? Any suggestions would be gratefully received. 2. St Neots area? The next pair of photographs were purchased at a fair as being taken somewhere in St Neots. Does anyone recognise the location? The right hand photograph has, in the background, a destinctive roof to a church, chapel, workhouse or other public building, with a small bell turret above the gable end . What about the individuals shown? Does anyone claim them as an ancestor? 3. Photo of Cambridge - Morris Oxford Press Ltd. This one isn't a "where is it?" more a "who done it?". 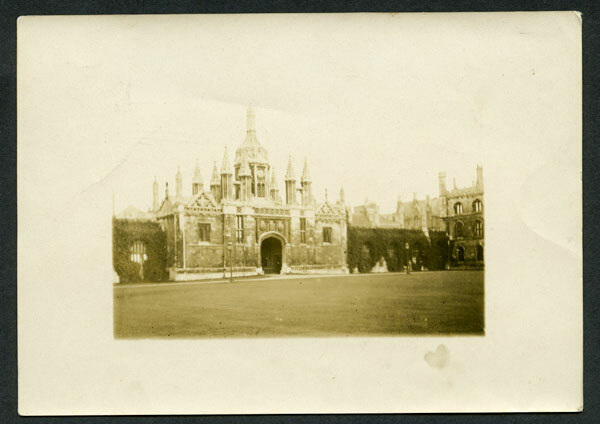 The photo below was one of a set of seven small albumen prints of Cambridge purchased at auction. The images are 4in x 3in printed on paper 6in x 4.25in. 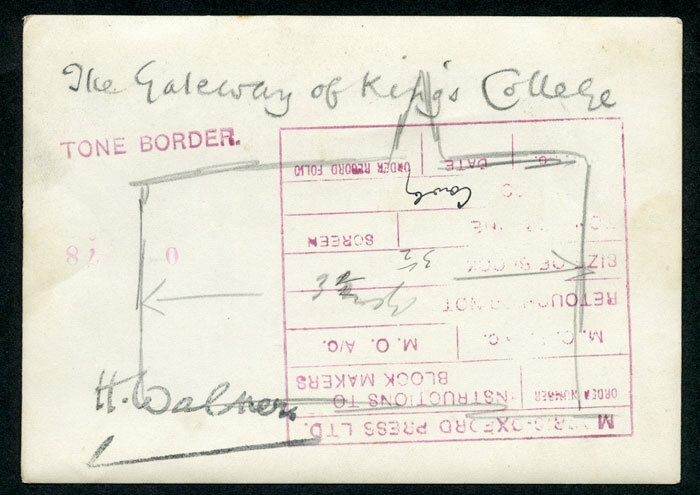 Each photo has the location written on the reverse and a rubber stamp facsimile signature stamp, presumably of the photographer. The photographer's name is "H.Walters" or "H.Walners". 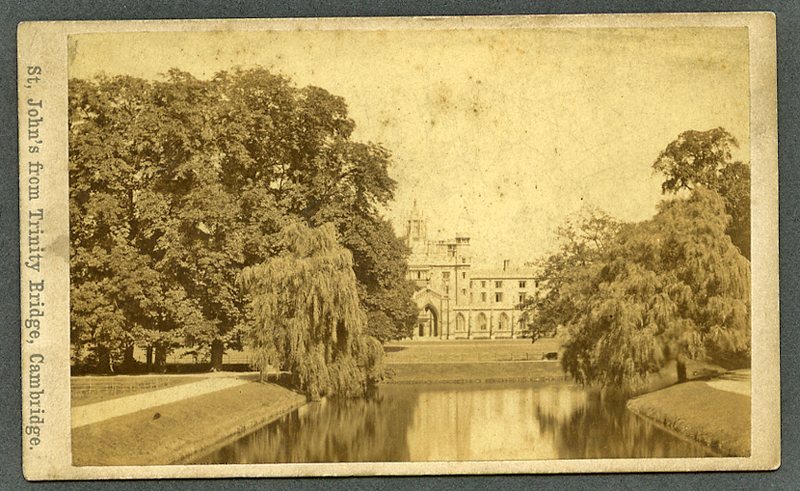 Locations written on the reverse of the prints are: "Peterhouse, the first College to be established in Cambridge", "The Mathematical Bridge, Queen's College", "Kings College and Chapel, with Clare College on left (have set of 12 of the Cambridge colleges", "The Senate House Cambridge", "Clare College", "Clare College Bridge- the bridge of uncountable balls" and "The Gateway of Kings College". Shown below is the last of these, which has a publisher's rubber stamp on the reverse with instructions to the block maker, suggesting this was made into a block and used in a publication. The rubber stamp is from "Morris Oxford Press Ltd". The 3.5 inch block was to be returned to them at Cowley. The only publication found by Morris Oxford Press Ltd is the "Morris Owner" Magazine which started in the 1920s. So, did this image appear in an article on Cambridge in that magazine? The photographer's name "H.Walters" or "H.Walners" has not yet been found in any research on Cambridgeshire Photographers, but Robert Pols lists an "H Walters" as a Suffolk photographer in Ipswich 1894-1918. The two dates - latest operation of H Walters and first publication of the Morris Owner magazine don't quite match up, so this might not be the solution. Can anyone help with the name of the photographer or whether this photograph was published, and where? 4. 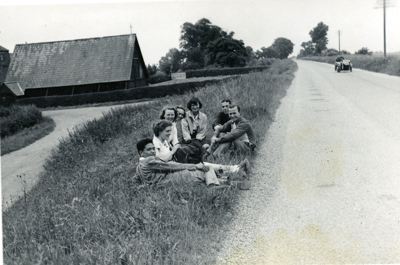 The road to Cambridge 1951. These two little 3 in x 2in prints show a group of walkers resting on a roadside verge. An inscription on the reverse of one states "On road to Cambridge 1951". Do you recognise the location - especially the large building in the background with a cross above the gable end? 5. Do you recognise this cap? This cap is worn by a young man in his 20s photographed by John Bull of 41 City Road Peterborough some time around 1900. The cap has the appearance of a sporting cap (an England Cap?) awarded to someone who was a member of a prestigious team in a major sport such as football, rugby or cricket. Identifying the cap may help us to identify the young Peterborough man wearing it. It has been suggested that the cap badge may well be a White Ensign, suggesting that the cap may possibly be something to do with a Royal Navy ship or shore establishment. Any other suggestions will be gratefully received. 6. Where was this taken? 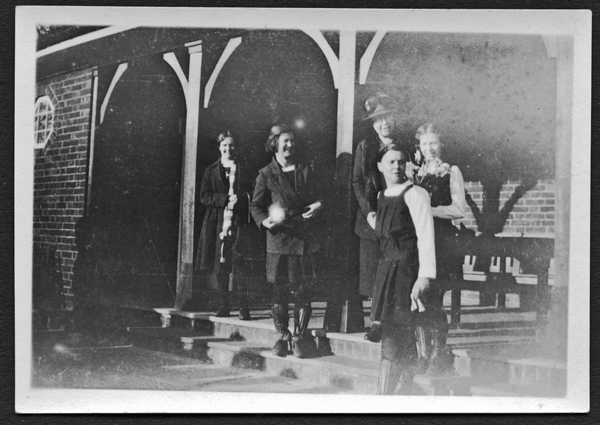 This small photograph, 3.25 x 2.25 in, is allegedly from Cambridge showing activity connected with girls hockey in front of what looks like a school or college pavilion. On the reverse is written "Hockey Colours 1932" The small octagonal window high up on the wall on the left and the wooden posts with curved wooden braces are quite distinctive - can anyone recognise the location please? 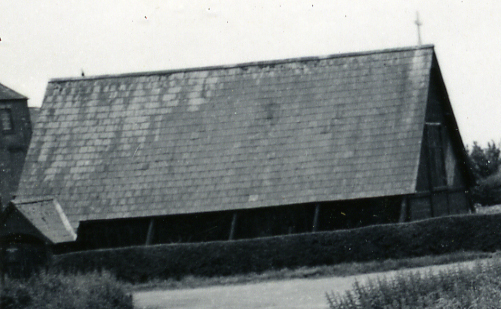 Could it possibly be Pye's Pavilion at Chesterton, Cambridge? 7. House with four gables. This cabinet photograph was taken by Farren Brothers, Cambridge and Chatteris, probably about 1870. 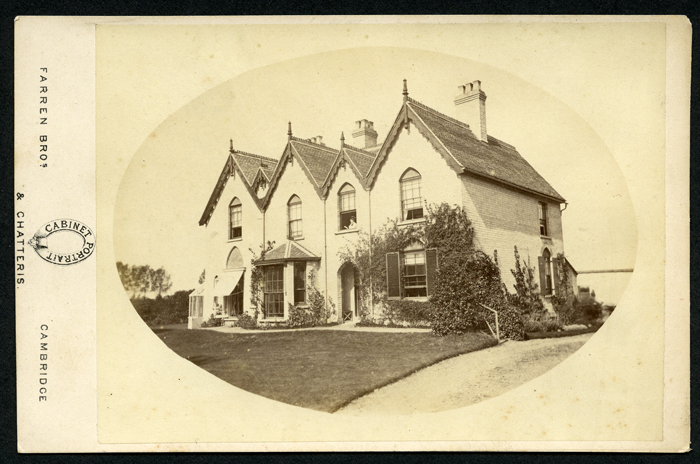 Can anyone identify this beautiful and distinctive Victorian residence from Cambridge, Chatteris or somewhere else in Cambridgeshire? 8. 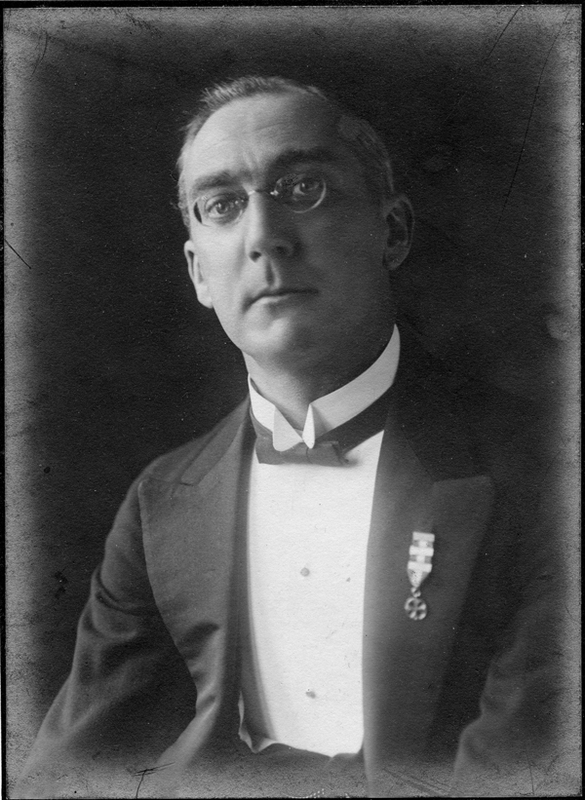 Whose portrait and who was the photographer? This next photograph is a sensitive portrait 6in x 4.5in on a cream mount 13in x 10in. 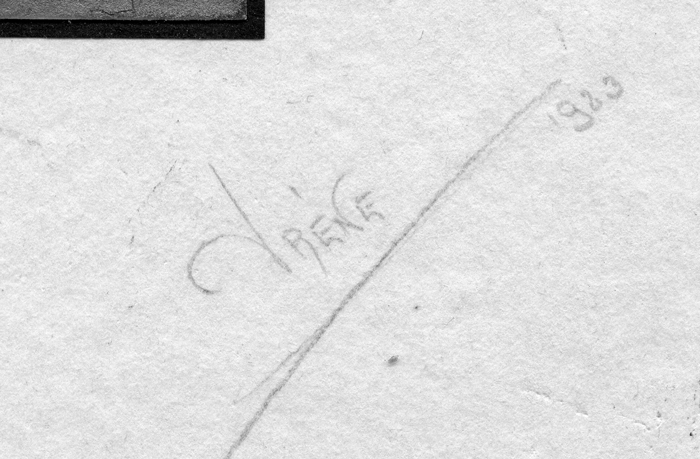 The mount shows the photographer's name as "Irene" and the date 1933. On the reverse of the mount is written "Ratcliffe, Storey's Way, Cambridge" in what appears to be the same writing as the photographer's signature on the face. No trace has been found of a Ratcliffe in Storey's Way Cambridge in local directories or voters registers and we have no idea who Irene might have been. The soft focus doesn't show much detail of the sitter's medal - but does anyone recognise it? 9. 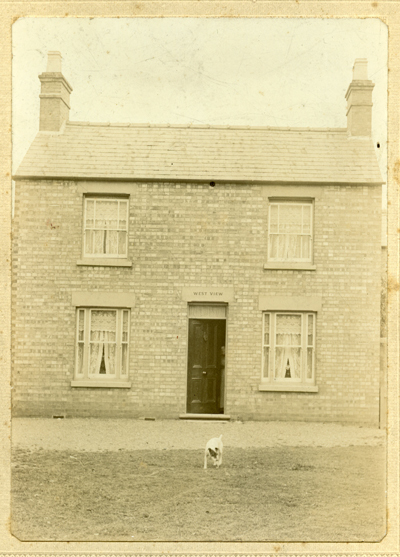 West View A dwelling house with small dog outside - "West View" is incised in the lintel over the door - the photograph is by WH Major from Peterborough, probably around 1920, so this is probably in Peterborough or one of the surrounding villages, but where? 10. 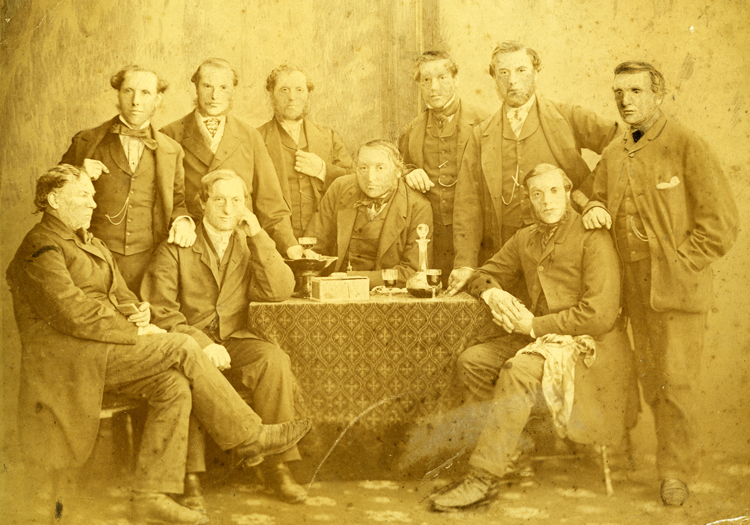 A Cambridge Group - ten ernest looking men in a posed group - 1860s-70s perhaps, albumen print 12 in x 8.5 in. Grouped round a table with a decanter, glasses and a box. One man seated on the right has a cloth draped across his knee - is this relating to some sort of cellar-man activity. Interestingly the pupils of the eyes of the sitters have been touched in with dye, which over the years has remained darker than the rest of the albumen print leaving a group with strangely staring expressions. This photograph turned up in the Cambridge area but could have come from anywhere. Does anyone have any idea what bought this group together, or where it might have been taken? What about the pattern of the table cloth - have you seen that amongst the props of any other photographer? Could this be - plucking possibilities from the air - the Cambridge Apostles? Good luck with trying to identify individual mambers of the 1860s Apostles in the group. 11. Puzzling Ladies with wristlets. 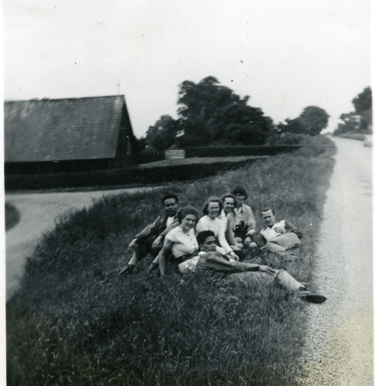 A group photograph from somewhere in the Cambridge Area, taken by ES Ball and Co Regent Studio, Cambridge. 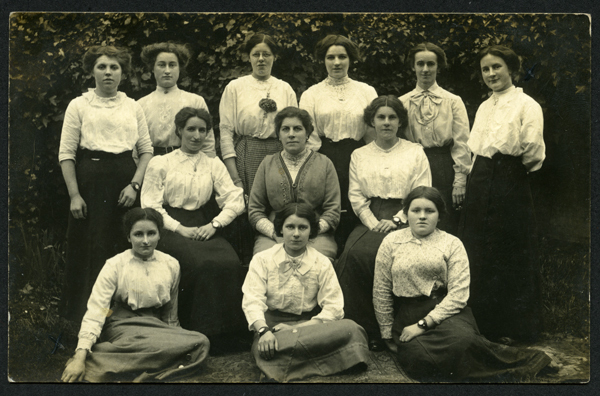 A group of eleven young women with one slightly more senior in their centre, taken outside the studio in a garden with either a hedge or ivy clad wall behind. The women are dressed in long dark coloured skirts with tight lacy blouses, making this circa 1905-10. Archivists at Girton and Newnham feel this is not a group from either institution. One intriguing detail is that it looks like all these women are wearing wrist watches, and some appear to be wearing identical wrist watches. What was this group and why was the picture taken? 12. Who was the photographer? The carte de visite below on a cream square cornered mount is a view of the Backs at Cambridge, the printed caption reads - "St John's from Trinity Bridge Cambridge". There is no photographer's name and the reverse of the carte is blank. Does anybody recognise the image and print style as relating to a particular Cambridge Photographer? Stearn's certainly did cartes de visite of St John's, but usually had their name on the face of the mount.